My name is Paul, and I am one of the newest team members of The RE Store in Bellingham. I became involved with The RE Store this summer when they gave me the opportunity to do some community service helping out in the store. At the beginning of this fall I was hired on as a temporary employee both in the store and on the Field Crew, which does various salvage and deconstruction projects throughout Northwestern Washington. I am the new pickup and delivery driver. My typical day consists of driving “Moe”, a box truck with a lift gate that is being loaned to The RE Store and RE Sources (our parent nonprofit organization) by a supporter in the Bellingham community. I go out to peoples homes or businesses and I pick up reusable materials, such as cabinets, furniture, and building materials, and I bring them back to the store. These materials can be donated for a tax deduction or for in-store credit, so customers can trade in the good materials they don’t need and come into the store and pick up other materials for new projects. I also deliver things to peoples homes that were bought from The RE Store, such as large pieces of furniture and cabinet sets. The most exciting thing for me about the pickups is seeing how happy people are to be able to see that their stuff is going to be reused. The most common thing I hear is “well I’m glad someone is going to be able to use and enjoy it.” With the deliveries, it is always fun to hear and see how the customer is going to use what I’m bringing to them to complete a renovation or re-furnish a part of their house. I am also able to work part-time on the Field Crew when they need an extra person for a project. The Field Crew bids on various projects, such as taking deconstructing kitchens, bathrooms, or entire buildings, like any other independant contractor. The difference is what happens to the materials that are being removed. The Field Crew takes out material as quickly and carefully as possible, with the goal being to reuse the material that is taken out; a typical contractor destroys most of the material that is being taken out, so instead of being reused, the material generally ends up in a landfill. A number of the large cabinet sets inside The RE Store, as well as a good portion of the dimensional lumber and sheet goods out in the warehouse, come directly from the deconstruction projects done by the Field Crew. Since having this great opportunity to become involved, I have been amazed at how much everyone – The RE Store and RE Sources employees, customers, and supporters – believes in what we are doing. People in the community understand and see the value in the idea of reuse. Not only does it keep things that still have value out of the landfill, it also saves the resources needed to produce new materials, and it keeps those resources within the local community. I am excited and honored to be a part of it. 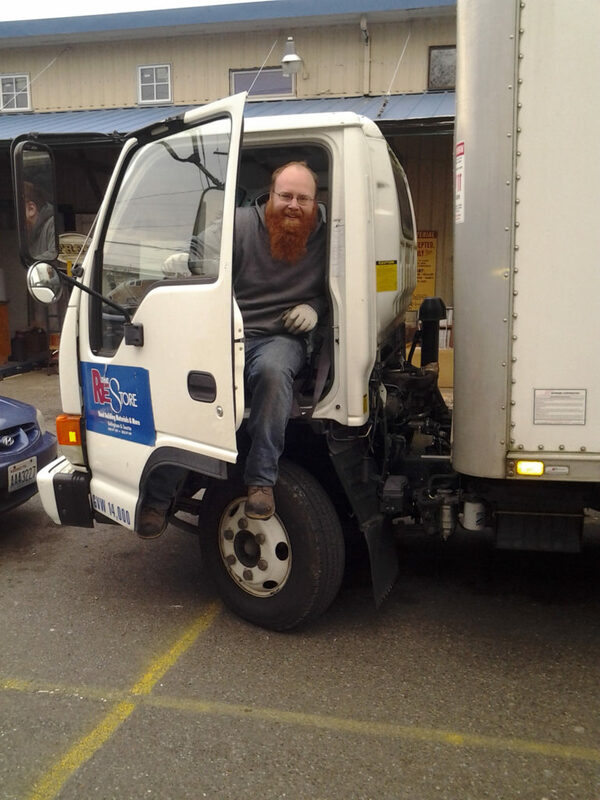 We are grateful for Paul’s contributions to the team – and for the donation of Moe the truck! We couldn’t do any of what we do without the use of trucks like Moe, and are in need of another one for our Seattle store. Please donate what you can to our Truck Fund here – to keep The RE Store Rolling!